The game is family friendly, really fast paced and lots of fun; but more than a card game, Dodgy Dogs is a design object. It’s simple, affordable, and exquisitely made. 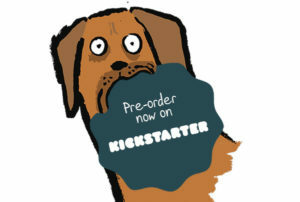 The Kickstarter campaign will be full of collectible items, from limited edition packs, limited edition signed prints, and even a couple of chances to have your dog illustrated by Jean Jullien and featured in the game. Dodgy Dogs is all about the comical world of naughty dogs. This is however not your typical pack of cards. Jean Jullien has meticulously illustrated each card with his distinctive black brush strokes, light-heartedly drawn characters and hued simplicity.